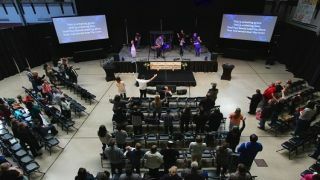 Based in Spokane, Washington, Sun City Church is an up-and-coming house of worship. It was founded in January 2015 by Pastors Danny and Jamie Schulz (they’re married to each other and have three kids). Sun City Church currently holds Sunday services in the cafeteria of Spokane’s University High School. Every Sunday before service the pastors and their congregation set the church up, hold the service, and then tear it down afterwards; like a rock band moving from town to town. It’s a daunting task, but Pastor Schulz doesn’t mind: “Doing the set-up and tear-down every week helps build our community through everyone working together,” he said. Sun City’s projection screens of choice are two Elite QuickStand 5-Second Series QS180HD free-standing screens, each one sitting on their own platform on either side of the stage. Measuring 180" diagonally across its total display surface, the QuickStand can be pulled out of its floor-sitting case in seconds, thanks to this screen’s dual cross spring mechanism. The screen’s display surface is comprised of Elite's MaxWhite Fiberglass (FG) 1.1 Gain material with wide diffusion uniformity. The QuickStand’s ATA wheeled case is made of durable aluminum to stand up to repeated setups/teardowns and relocations; exactly what Sun City needs as a mobile church. The content for the Elite screen is fed from a Mac Mini computer. It is then displayed on the screens via two Optoma EH501 5000 lumens video projectors. For audio, the various instruments and voice microphones are fed into a Behringer X32 Rack 16x8 digital audio mixer located back stage. With the additional Behringer S16 16x8 Digital Snake connected via the AES50 Digital I/O, the whole digital audio mixer provides 32x16 XLR connections in the back stage portable rack. The church’s AV crew controls the board remotely using an iPad or Android tablet running the X32-Mix app from MUSIC Research Group UK Limited. The musicians also have access to three Behringer P16-M 16 channel digital personal mixers. “Each vocalist uses the Behringer X32-Q personal mixer app (iOS/Android) to set their own IEM mix directly from all 32-channels plus effects with the X32 Rack/S16 digital mixer,” said Ben Hinson, one of the church’s audio engineers/musicians. “The response from our vocalist has been incredible when they realize the power they have to fully control their own IEM mix." To deliver audio throughout the cafeteria, “we have two JBL speaker stacks on either side of the stage; made up of two PRX712 12" full-range speakers, a PRX715XLF 15" subwoofer, and a PRX718XLF 18" subwoofer,” said Pastor Schulz. “We also have two JBL EON-610 10" monitors on stage, plus Galaxy Audio ANY SPOT AS-1100/AS-1800 wireless in-ear audio monitors.” Sun City Church uses Shure QLX-D and BLX wireless microphone systems (with KSM9, BETA 58A, and SM58 microphone elements, and Countryman E6 headset), plus Audix drum and overhead mics. Sun City Church’s AV system fits nicely with this house of worship’s fast-turnaround mobile mandate. The AV system delivers the multi-media impact the church is looking for, while accommodating the congregation’s nomadic existence. Overall, the system is in line with Pastor Danny Schulz’s belief in the power of AV to deliver the Word of God; a faith he has held since starting work as a pastor ten years ago. James Careless is a regular contributor to AV Technology.